The landscape is covered in several layers of snow “blankets” now. This deep cover of snow has the effect of softening the look of the landscape by softening rough features and edges and essentially white washing everything. Curiously, the snow cover has the same effect on sunlight, especially early in the day, when the sun has just made it above the tops of the mountains and begins to light the landscape. Even though we are past the half-way point for the calendar winter, the suns light is still weak when it first touches the ground in the morning. Combined with the extensive and deep snow cover, the effect is that of a very soft looking light. In visual terms, the effect is most noticeable in the limited range of values in the landscape. There is virtually no black or even dark grey passages. The blue and blue-grey shadows are soft-edged and also not very dark. It is a difficult kind of scene to paint, because, if the depiction if accurate, the lack of deeper values can leave the painting with an unfinished look. One objective was to maintain the soft, subtle and light colored shade and shadows on the ground along with the subtle cast shadows on the bridge itself. All while still presenting a painting with a finished look. It is very easy in watercolor to have too little color and value in a painting anyway. In this work, it was important not to have that happen. 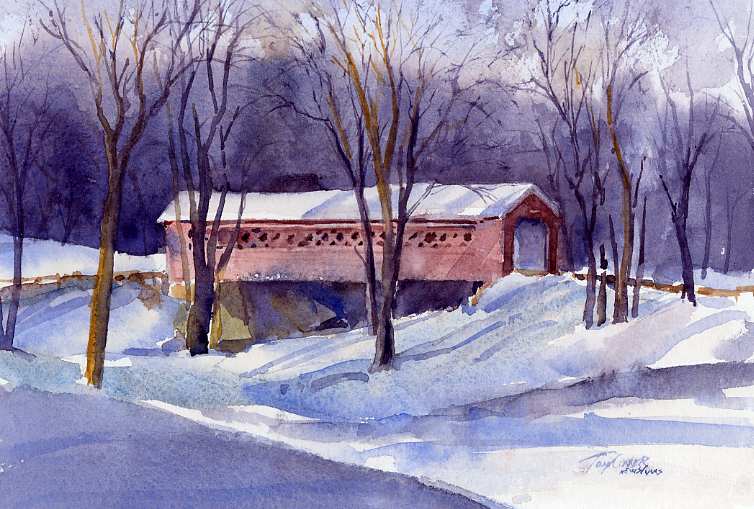 Adding additional color and value in certain areas – like the large, shadowed snow area in the left foreground and a nebulously dark area in the space under the bridge, helps balance the overall light and mid-value tones that dominate the space. The subject is the Henry Bridge in North Bennington, Vermont – a favorite subject in all seasons. All editions are limited to 50 prints and are mounted and matted to a standard size for easy, low-cost framing. “8 AM” is mounted and matted to 11″h x 14″w. For easy, low-cost framing. Shipping and Handling to any U. S. address is $6.95. Click “Add To Cart”, below to purchase. Or click here to learn more.